In an Washington Post article about Barbaro, Jane Smiley wrote " there is something extra large about the death of a horse." It's more than just their size, although I suppose that's part of it. Smiley is saying that horses are an enormous presence in our lives. But when they die, it is their physical size that brings us face to face with sad practicalities. As a peripheral observer when a horses have died at boarding barns, I know that whatever happens, happens fast. If anything there is a tarp on the ground for awhile, and then the horse is just gone. I'm not overly sentimental, but who doesn't want dignified treatment of a deceased equine friend? If I can afford the horse, can't I afford to see that my horses aren't simply discarded? There are bereavement/cemetery services that try to meet the needs of horse owners. Some offer burials, but cremation of horses is a growing trend as land becomes more scarce and burial restrictions impinge on once-rural areas. The question is whether cremation is a feasible choice for me. Here is what I learned from a bit of research. 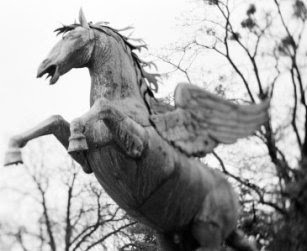 Cremation fees include "respectful" removal of the horse , the actual cremation, and the urn to hold the ashes. Companies say that the transport vehicle is customized with features that facilitate respectful handling of the animal. I wonder if they aren't similar to the emergency vehicles they use at vet facilities. Some vehicles are refrigerated, but I don't find that especially comforting. Transport of the animal can be as high as $3-5/mile, and many services do not permit "drop-offs." I checked a number of web sites -- very non-scientific! For a pony or Foal, fees ranged from $600-$1000. For a horse (1000-1600lbs. ), the range was $1000-$1998. Some companies allow you to be present at the cremation; this is usually done to ensure the right remains are returned. I'm not sure how "up close" you'd get, but if you're considering this you might want to take a look at two large animal cremation units I found on the Web (one and two). Some services offer communal cremations (more than one animal) -- these are less expensive. You may choose to have your horse returned in a plastic container, ready for ceremonial spreading, or a wooden urn which usually involves an extra charge ranging from $100 to $300. One company makes a tiny necklace that holds a small sample of the horse's ashes. You can also find more basic cremation services from animal diagnostic labs -- labs may offer disposal and/or cremation, often at a reduced cost. Keep in mind that this is a no frills option, and you may or may not get a bedside manner at these rates. For example, the Illinois lab Web site states that "cremation with ashes returned is $.15 per/lb." There may also be restrictions on how or whether they accept an animal. You will find a listing of vet schools and labs at Vets for Equine Welfare. I've made a few calls -- there are companies that offer cremation in my area -- but haven't decided what I'll do. Knowing me, probably whatever is simplest and fastest. I've had two of my horses cremated and returned in a wooden box. And while it's expensive, I feel I owed my horses a respectful burial after having had them for many years and for all they had given me. So I would recommend it to anyone who loves their horses and want to see them treated as well in death as they were in life. 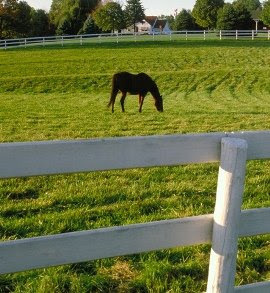 When we had to euthanize our mare, we borrowed a backhoe and buried her in our field. I think living as far from civilization as we do, cremation would be very cost prohibitive. Also, it is comforting to my daughters to know that Lucky is buried beneath the grass and the flowers beside the house, next to their first dog. She lives on in my memory. Cremation was never a consideration for me. Call me callous or call me practical. My horses were who they were in life and in my memories. I love each one with all my heart, and it is their spirit that lives with me. In death, they are a large carcass that needs to be disposed of properly and quickly. Burial at home would be my first option but it is illegal where I live. So, for the two times I've needed to, I have used the local service that picks them up and takes them away. I don't want to know where they go from there. Cremation is too expensive for me and my horse budget is limited. Some people might say, well, it's only another 1k or so to have the horse cremated instead of just removed. To me, it's another 1k towards my next horse. Hope my blog entry doesn't suggest that yours is a bad attitude to have. I can certainly understand why you'd want to put your resources toward living animals. It's a good topic. Anyone involved with horses needs to think about it. Anyone taking a horse under their care needs to be prepared bacause unfortunately, "crap happens". When my friend's horse died in his stall from heart failure a month or so before I had to put Monty down, in the emotion of the moment she went and had her horse cremated and bought a fancy urn and when she got the bill she was shell-shocked. Then it became, "how will I ever buy a new horse when I owe all this money for the remains of the one I just lost"? She's taken to fostering a rescue which is great but now she's spending more money she doesn't have on lessons to learn how to ride him. She has often told me she wishes she had listened to me when I used to have discussions about what to do with them when they go but it was easier to deny thinking about it. When it comes at you as a surprise as it did in her case, emotions can affect your thinking and afterward you can't go back. I think cremation is wonderful for those who choose it as long as it is affordable for them. Whatever makes you feel at peace in a time of great sadness as long as there are no regrets afterward is the best choice. I also live in a very rural area and happen to have a neighbor with a backhoe and a soft heart, so I'm lucky that burial is a practical choice. As my mares pass on they're buried at the far end of the back pasture underneath the trees. My other option is the rendering truck, though some companies won't pick up horses that have been euthanized (the fur farm wouldn't as it would make the mink sick). They also charge more money than I usually have on hand. If I had a lot of money to throw around, though, I would consider cremation so I could save some of the ash and have a jewel made (lifegem.com), as the mares all had jewel names. When my horse died last fall I was facing $5k in veterinary bills. I also wanted a full necropsy performed . . . so for me, I opted simply to take hair from his tail and let them dispose of his body. Had he not died at Tufts, I would have buried him where I had him boarded but the costs involved with transportation or cremation were very high and I couldn't justify spending any more than I had done trying to keep him alive. I'm with SolitaireMare . . . I would not spend upwards of $2000 for cremation, etc. My animals' lifeless bodies are not THEM. I'd rather spend that $2000 on a horse who needs a new home than on a horse who had a good home and no longer needs it. Heck, I'd rather donate the $2000 to a horse rescue than spend it on cremation. My instructions are to my fiance are that if something happens to Brig (God forbid!) he is to take care of everything with the help of the barn manager in the least expensive, most efficient and easy way they can find. I don't want to know where or how. I just want his forelock. Very interesting, I hadn't thought of this directly. I'm a big animal-lover and animal-rights advocate. I definitely agree with the idea of taking care of your horse after it passes. Your site is good for getting people to think about this. Anyone here do the same thing for their cats, and birds? I don't see much of a difference. Growing up we buried our birds. this one is a sensitive subject for me. i'm not a sentimental person, and i have no convictions about an afterlife or anything like that. i just feel that any life i am responsible for - particularly when that life was also part of a meaningful partnership built on trust and mutual respect, deserves to be treated with dignity when it comes to an end. i have had two horses die at the clinic after failed surgeries, and they offered to let us take them back to the farm to be buried, 'dispose' of the body (i.e. send it to be rendered - after all, dead horses are just 'meat') or be cremated. for us, the most practical and respectful was cremation. if any of our other horses die at home we will probably bury them on the farm, but if it were illegal to do so, i'd have them all cremated. i understand for some people horses are nothing more than livestock - a commodity to be traded and disposed of at will, or a piece of sports equipment that is easily replaced. i hear this argument all the time, not just against costly disposal, but against all kinds of ethical considerations and responsibilities. but my belief is that, once we undertake the training and education of a horse, once we ask him to trust us and work for us, he ceases to be livestock and becomes something more than the average side of beef and should be treated accordingly. so i would not be able to send him off to become processed (the proverbial "glue factory") or to rot in a landfill. and it has never even entered my mind upon losing a horse that i need to save my money to replace him immediately, because he was an individual and irreplaceable. i also would not own a horse if i was unable to pay his feed and medical bills, and i consider final expenses in this category. call me sentimental, but i wouldn't do it to a beloved dog, and certainly not a family member, so what makes my horses - my partners and friends for whom i have assumed all responsibility - any different? I had the two beloved horses I lost taken away. To me, their lifeless bodies no longer were the beautiful souls I loved so well. If I had the option, I would love to have had them buried here, but it was not a legal alternative. My third loss was on the surgery table at New Bolton for a colic surgery and the hospital took care of him for me. I certainly respect other people's feelings and opinions but for me, this was the best solution. My Boys still live in my heart and gallop along in my memories with shining coats and huge hearts.